Roper Rhodes collection of concealed all-in-one shower systems offer a luxurious showering experience combined with good looks. The Event Round Concealed Dual Function Shower System features an automatic shut down if the cold water pressure should suddenly fail and is limescale resistant. 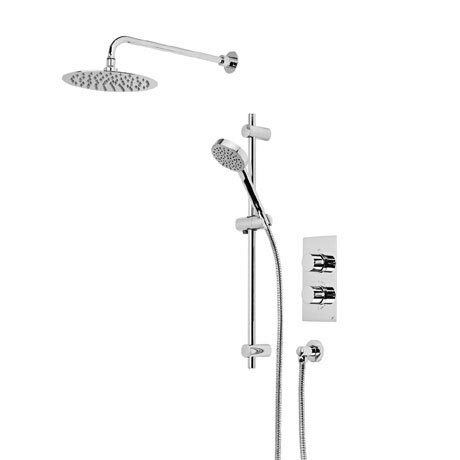 The package consists of a two way diverter thermostatic shower valve, 460mm length adjustable fixed arm, 250mm stainless steel shower head, Wave adjustable riser rail, single function shower handset and a brass shower hose & wall elbow.